A relational algebra engine which can be used to persist and query Haskell data types. Software can always be made faster, but rarely can it be made more correct. Project:M36 implements a relational algebra engine as inspired by the writings of Chris Date. Unlike most database management systems (DBMS), Project:M36 is opinionated software which adheres strictly to the mathematics of the relational algebra. The purpose of this adherence is to prove that software which implements mathematically-sound design principles reaps benefits in the form of code clarity, consistency, performance, and future-proofing. Project:M36 can be used as an in-process or remote DBMS. Project:M36 is written entirely in the Haskell programming language. You can experiment instantly with Project:M36 straight from your browser at try.project-m36.io! Project:M36 supports multiple frontends which target different audiences. 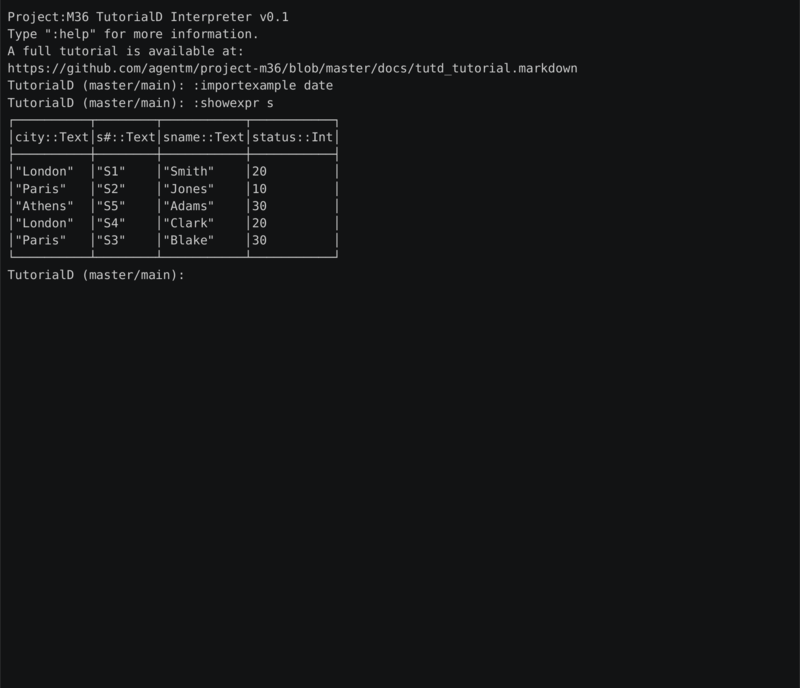 Project:M36 is developed in Haskell and compiled with GHC 8.0.2 or later. Out of the Tarpit: a proposed software architecture which minimizes state and complexity. Project:M36 implements the requirements of this paper.